Coming back from a week’s vacation, exploring the beauty of Cancun and splurging into the blue water – my refrigerator was frighteningly bare. I was missing the Mexican flavors that I had indulged in during the week and I craved to bite into the same yummy salsa and tortilla and Arzo (rice) but alas, reality struck! I made a quick trip to the nearby grocery store and picked up fresh vegetables. While walking the health aisle of the grocery store with glazed look I found Farro and immediately it struck me that I can create a flavorful healthy Mexican dish. At the same time I wanted something quick and not too much time consuming. My cheat days were over and I immediately caught onto healthy eating track so I wanted to cook everything from scratch and make it low calorie food with balanced nutrition, hence the idea of Farro Black Beans Mexican Bowl came to my mind. Farro and black beans are the main ingredients for good carb and protein in this recipe and to add to the flavors I picked up fresh jalapeno peppers to give this recipe a spicy touch, some green bell peppers to pump up the Vitamin C and E, fresh cilantro for flavoring, and beautiful tomatoes for the base. (While in Cancun I learnt that the bulk of tomatoes are exported from Mexico and it’s an important ingredient in most of the Mexican dishes). I used some sweet corn kernels to give a sweet flavor, added some lime juice (lemon juice may also be used) to make it slightly tangy and topped this Mexican bowl with fresh lettuce and avocados. You may also garnish with sour cream and cheese if desired. My idea was to make a dish that was one pan flavorful Mexican meal, so I flavored the warm oil with garlic and oregano first and then mixed in the rest of the ingredients except lettuce and avocados. 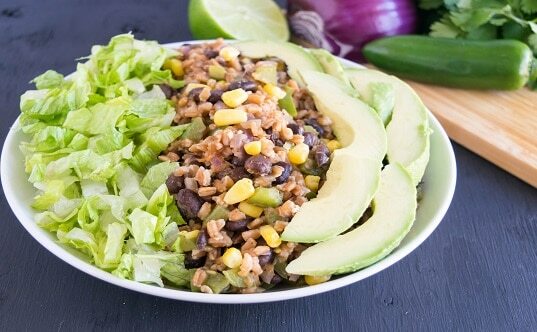 I love the fresh and crunchy texture of lettuce, and fresh sliced avocados give this Farro Black Beans Mexican Bowl a light creamy texture. If desired you can garnish with grated mozzarella cheese and sour cream. (The nutritional value would slightly change in this case). If jalapeno peppers are not available red crushed pepper may also be used according to taste. Black beans are one of my favorite things to eat. I can’t wait to give your recipe a try! This looks so delicious! I’m so glad that it only takes 20 minutes to do. I used to prefer red beans over black beans but I’ve changed my tune in the past year! black beans and avocado are one of my favorite combos. I haven’t tried farro yet. It’s in my “to make” list. I love black beans and that looks delicious!